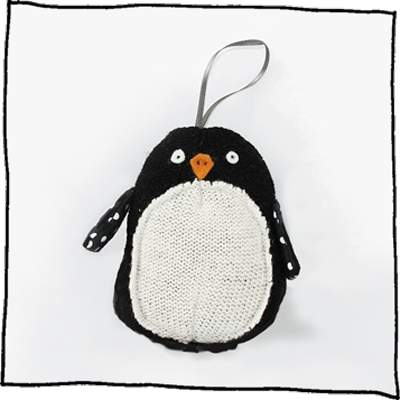 Liven up your Christmas tree with this cheeky Penguin, hand knitted from the finest lambswool. Children and adults alike will delight in the soft body and hand-stitched features. The wings are patched with gorgeous vintage fabrics, so no two decorations will ever be the same. Baby Penguins are also available, so why not start your own family? Your Penguin can be personalised with up to two initials hand stitched onto its tummy. Use the box below to enter your choice of initials. The Penguin is beautifully gift-wrapped in a fabric bag.